It’s hard being away from your child when they’re sick. Only last month we settled Laurel in at college, and already she texted me that she’s sick. Something’s going around in the dorms now. Oh how I wish I could make her a big pot of soup and be there to mother and comfort her, but next best thing I could do was to make her some packets of almost instant soup. 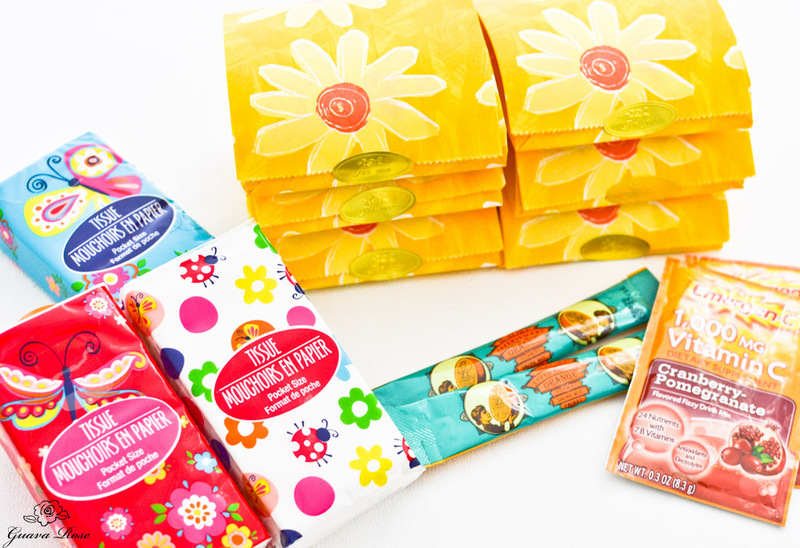 I sent some cheerfully wrapped packets to her, along with some vitamin C drink mixes and pocket tissues. Hopefully this little love from home will make her feel a little better and lift her spirits. The bouillon cubes shown above are actually double the size of normal cubes, so you have to read the labels and serving sizes carefully on the different brands and adjust accordingly and to taste. 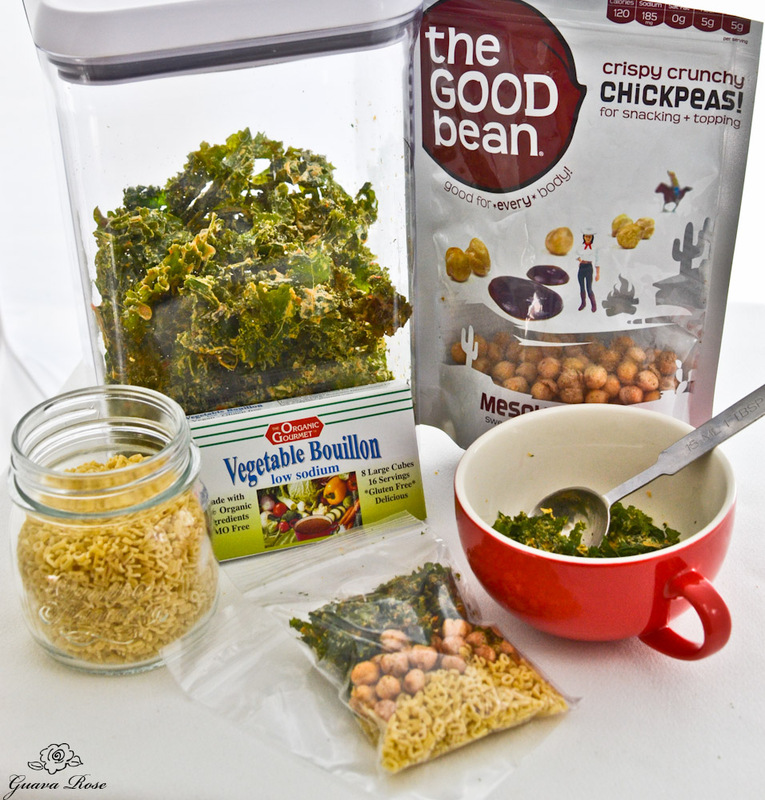 For each single serving packet: 3 T. small pasta, 1 regular size bouillon cube or 1 T. powdered broth, 2 T. crunchy chickpeas, and 4 T. crushed kale chips. Layer into small ziplock bags. Soup base: 1 standard sized bouillon cube -they are so salty though, get the low sodium/salt free ones and add sea salt to taste; my favorite is a vegetarian chicken bouillon powder from the bulk bins at my food co-op. 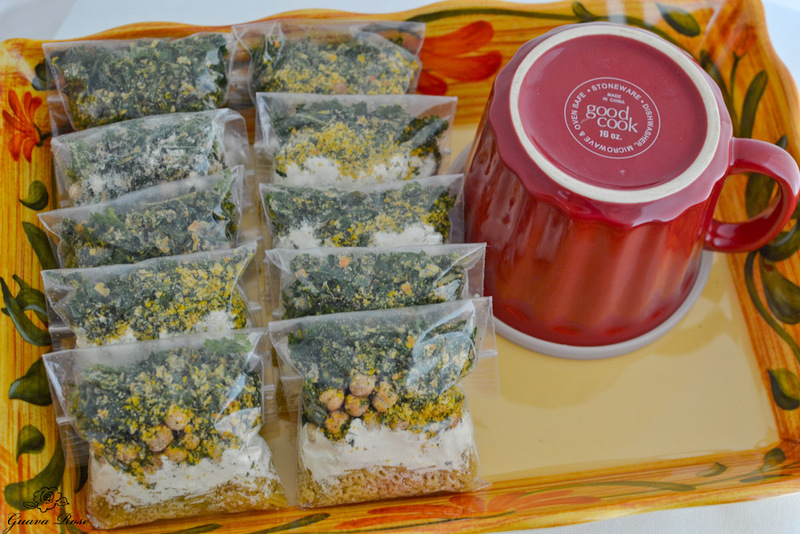 Kale chips: these are my homemade nacho cheeze ones that I make in my dehydrator. We definitely prefer dehydrated ones vs. oven baked. The latter have never turned out well for me–either tastes like steamed kale or burnt tasting. For ease, you can just buy kale chips, though they tend to be a bit pricey. Laurel already has this handy red mug. I thought it was the perfect size to use as a mug or a bowl in her dorm room. To prepare the soup, place the contents of one packet into a 2 cup mug. Add 8 oz. water. Microwave on high for 3 minutes. Cover and let sit for 10 minutes. Stir and enjoy. Pretty simple to do in a dorm room. These packets may also be nice to have around during the cooler weather for any kids or house guests to have something warm and savory easily. 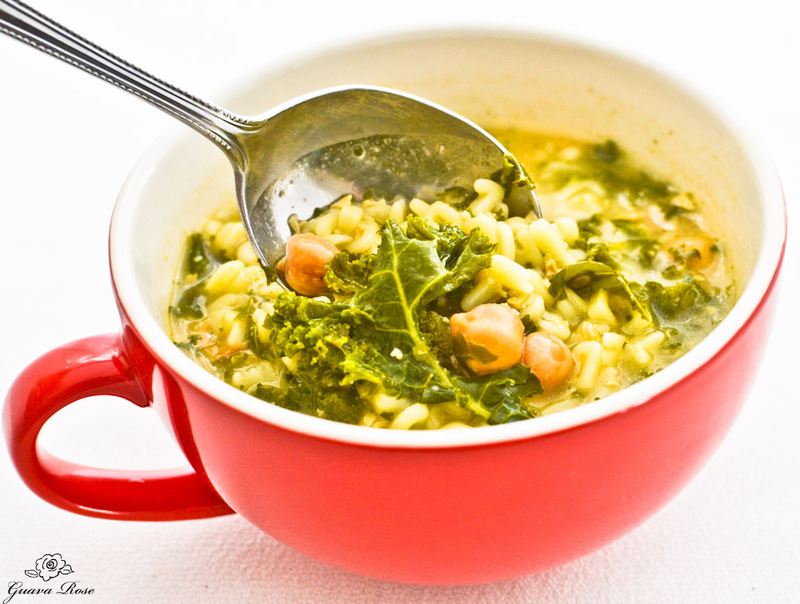 Definitely a good and tasty way to have some leafy greens! Layer ingredients into small ziplock bags. 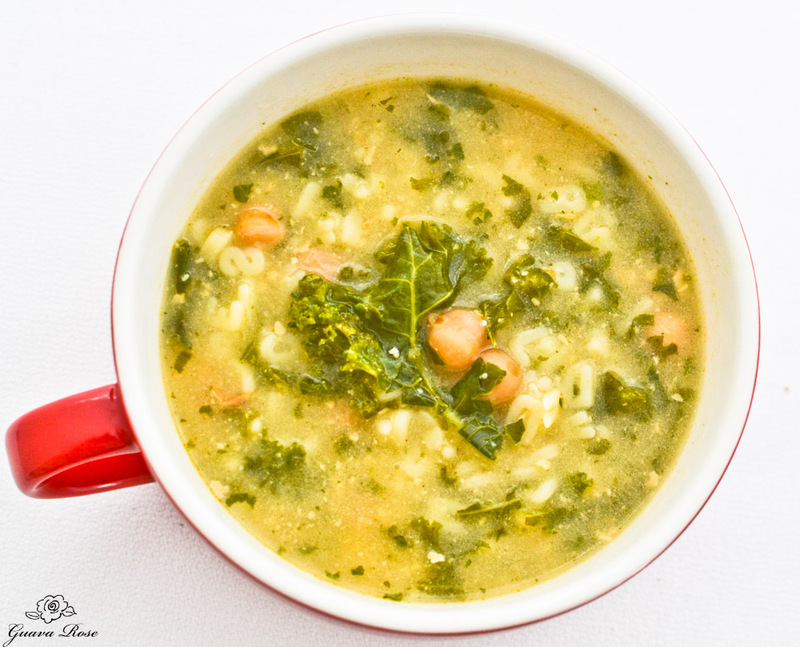 To prepare soup: Add contents into a 2 cup mug along with 8 oz. water. Microwave on high for 3 minutes. Cover and let sit for 10 minutes. Stir and enjoy.